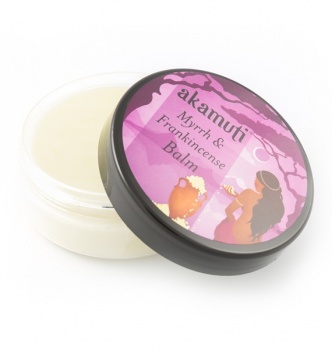 This rich luxurious balm combines the power of two incredible tree resins frankincense & myrrh. These resins have been revered since ancient times as wonderful skin tonics. They are among some of the oldest aromatics known to man. Myrrh has incredible properties attributed to its bitterness â€“ it is an effective purifier. Frankincense works by invigorating & uplifting while being calming. These resins are two of our favourite ingredients because they are so useful & versatile. Super Rich Intensive Face Treatment: If you have very dry or mature skin this works brilliantly as an intensive treatment to rejuvenate & purify your skin. Caring Balm: Apply to marked, blemished skin. Aromatic Rub: Frankincense is renowned for its calming qualities and is used in meditation. Tip! Balms & salves are often most effective if applied before a nights sleep, giving the balm plenty of time to penetrate the skin.